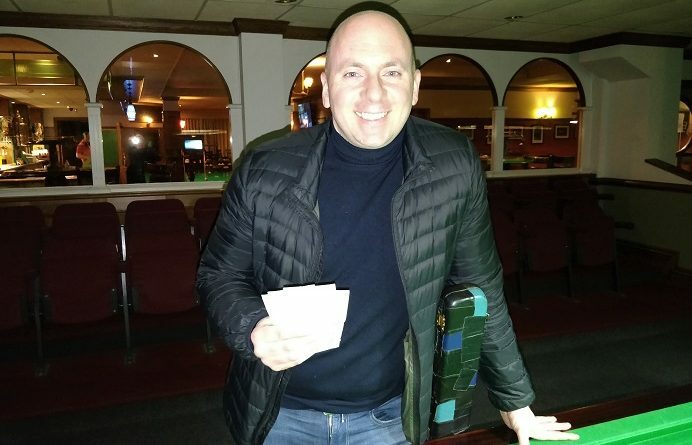 The 43-year-old from Bracknell pocketed £100 prize money after beating Didcot’s Neil Craycraft 2-0 in the final of the fifth leg at Jesters Snooker Club, Swindon. Ford, who won the previous tournament that he entered in Bournemouth in November, dropped only two frames all day. And he knocked in the highest break of 87 and five others of more than 50 during the event sponsored by luxury goods supplier The Xander Prestige Group. But he was not fazed by being drawn with Craycraft, Chris Rigby, Darren Johnson, Neil Herd and Paul Burt in the group stages. “I was quite pleased with how I played all day,” he said. “I had a tough group and that I think helped my concentration. Remarkably, 17 of the 20 breaks of 40 or more were recorded by the players in Ford’s round-robin group. John Hunter (Andover), who lost 2-0 to Ford in the last-four, remains top of the rankings. Ford is 28 points adrift in second place. Martin Wallace (Wokingham) is third. John Monckton (Woking) climbed to 11th after his first semi-final appearance of the season. Stephen Hills (Northfleet) qualified for the knockout for the first time in just over two years. Phil Morgan (Salisbury) remains top of the Masters (55+) rankings. Chandlers Ford Snooker Club hosts the sixth fifth leg of eight on Sunday, February 17. For more information about the event sponsor, visit www.xanderprestigegroup.com. Matt Ford: 87, 68, 57, 55, 54, 53, 48, 48. Neil Craycraft: 73, 67, 65, 61, 53, 45, 40. GROUP A: 1st, John Hunter (Salisbury SC); 2nd, John Monckton (Woking SC); 3rd, Dave Pullman (Boxmoor Social Club, Hemel Hempstead); 4th, Paul Rose (Jesters, Swindon); 5th, Pay Patel (Crucible, Newbury). GROUP B: 1st, Martin Wallace (Crucible, Newbury); 2nd, Paul Lawrence (Park Gate RBL); 3rd, Dan Hammond (Chandlers Ford SC); 4th, Richard Arnold (Salisbury SC); 5th, Scott Griffin (Jesters, Swindon). GROUP C: 1st, Matt Ford (Sunninghill Comrades Club); 2nd, Neil Craycraft (Jesters, Swindon); 3rd, Chris Rigby (Chertsey SSNR Club); 4th, Darren Johnson (Petersfield Bowls & Snooker Club); 5th, Paul Burt (Salisbury SC); 6th, Neil Herd (Salisbury SC). GROUP D: 1st, Neil Carroll (Chandlers Ford SC); 2nd, Stephen Hills (Traders, Northfleet); 3rd, Andrew Darken (Chertsey SSNR Club); 4th, Phil Morgan (Chandlers Ford SC); 5th, Peter Chin (Jesters, Swindon). QUARTER-FINALS (12 pts): Hunter 2-0 Hills, Ford 2-0 Lawrence, Craycraft 2-0 Wallace, Monckton 2-0 Wallace. SEMI-FINALS (15 pts, £30): Ford 2-0 Hunter, Craycraft 2-0 Monckton. FINAL (25/18 pts, £100/£60): Ford 2-0 Craycraft.